Vintage back issues of Zigzag magazine always available with negotiable prices for multiple purchases. 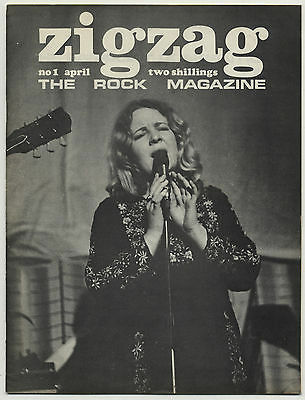 At the tail end of the sixties Pete Frame launched the greatly respected UK Zigzag magazine which featured acts like Bob Dylan, Frank Zappa, Led Zeppelin, Traffic, Grateful Dead, The Byrds, The Who, Pink Floyd etc. Starting publication on 16th April 1969 as a Rock, Blues and Folk music magazine it slowly changed with the popular music scene through the 1970's with Prog and Folk Rock and then moved on to Punk Rock, New Wave & Goth Rock etc in the late 70's & early 1980's. Zigzag magazine regularly featured excellent interviews, well researched articles, record reviews and early issues featured "rock family trees" intricately put together by Pete Frame.